Common Names: Mopoke, morepork, freckled frogmouth, night hawk, podargus, tawny shouldered frogmouth. 1. This curious-looking bird has a wide, frog-like beak and large yellow eyes to help it catch insects at night. It has bristles above its beak and mottled brown, black and white plumage which provides excellent camouflage. 2. There are two possible color phases, grey and rusty brown. This bird is arrayed in a swirling marbled pattern of various shades of grey. Its hooked beak is triangular in shape and sits below two large golden eyes. They use their short legs and small feet to perch in the trees. Its small rounded wings make this bird somewhat less adept at flight than other birds in its genus. 3. These creatures are nocturnal, hunting between dusk and dawn. During the day, they sleep perched lengthwise along tree branches, their coloration allowing them to blend in perfectly. 4. The Tawny Frogmouth is a carnivore. It feasts on insects, worms, slugs, snails and small lizards, and catches some prey, like moths, in mid air. 5. Rather than actively seeking prey, this bird prefers to wait on its perch for prey to come to it. 6. 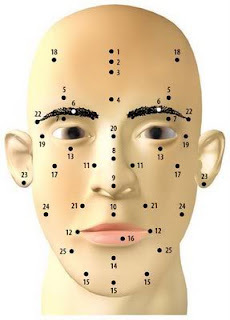 The only way to distinguish between male and female is by the iris of the eyes. The female eyes are large and round with a yellow iris and black pupil. The male has a ring of orange brown surrounding the iris. 7. Tawny Frogmouths are not owls. Although they look similar, Frogmouths are more closely related to nightjars, which are nocturnal birds known for having long wings and short beaks. 8. 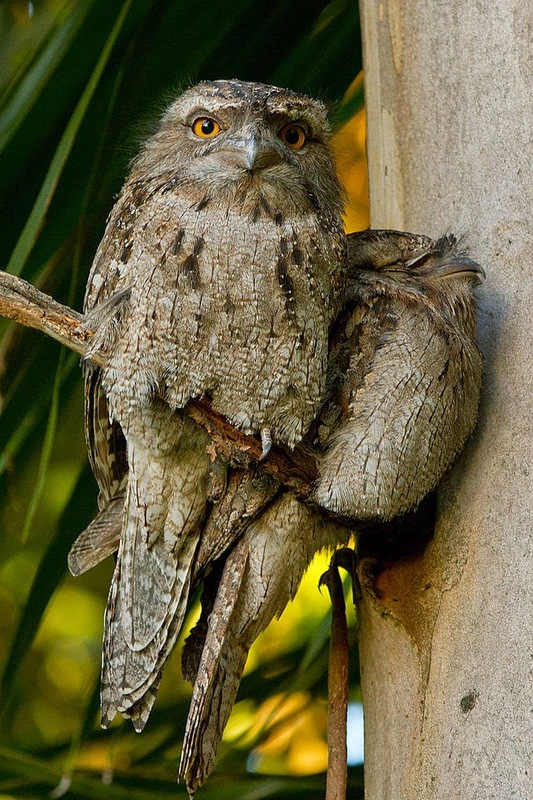 Tawny Frogmouths sit motionless on branches with their large eyes closed during daylight; their cryptically colored plumage camouflaging them from predators. At night, they watch for movement of prey on the ground below. They then glide silently down on their prey, snatching it in their huge beak or using it to beat it to death against the ground. 9. 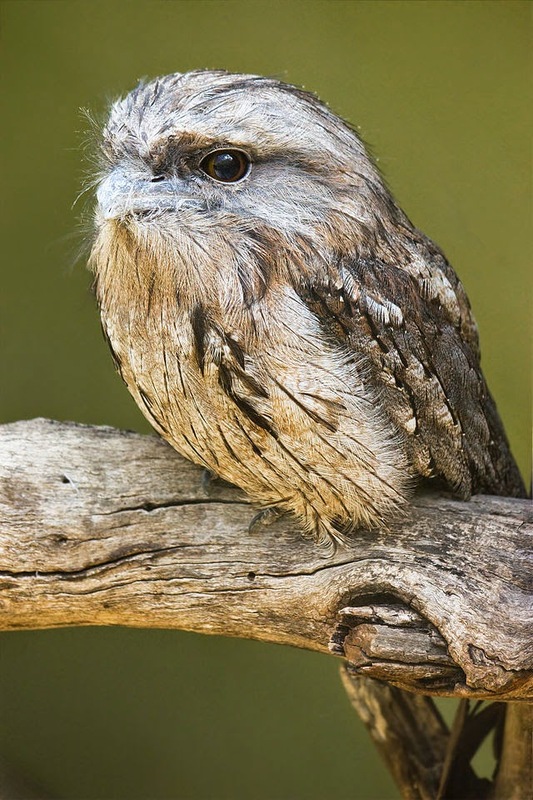 If a frogmouth is disturbed, it may adopt a threatening pose, fluffing out its feathers, showing its wide orange eyes and opening its beak in a wide froglike gape to reveal its yellow throat, hoping to appear intimidating. 10. They once were thought to be related to the goatsuckers or nightjars (so named because of their “night-jarring sounds”). Ancient Greek goatherds, seeing nightjars hovering open-mouthed about their animals in the evening, believed that the birds were sucking milk from the teats of goats. In reality the nightjars were hunting bugs stirred up from the grass by the goats. 11. Low repeated “oom-oom-oom-oom,” slow or quite rapid and repeated up to 40 times; seems to have no distinct beginning or end. While the sound may be heard over a mile away, up close the vocalization is barely audible. 12. The nest is a shallow, flimsy platform made of small sticks or a wad of its own feathers ,camouflaged with plants, placed on horizontal forks of a tree. Sometimes uses the old nests of other birds such as the Australian magpie or white-winged chough; two white, rounded eggs, incubated by both parents (the male by day and the female by night). Nestlings are downy white.